You are at:Home»Learn & Live the Faith»Catechesis»The Eucharist: The Body of Christ? The Catholic Church teaches that in the Eucharist, the communion wafer and the altar wine are transformed and really become the body and blood of Jesus Christ. Have you ever met anyone who has found this Catholic doctrine to be a bit hard to take? If so, you shouldn’t be surprised. When Jesus spoke about eating his flesh and drinking his blood in John 6, his words met with less than an enthusiastic reception. How can this man give us his flesh to eat? (V 52). This is a hard saying who can listen to it? (V60). In fact so many of his disciples abandoned him over this that Jesus had to ask the twelve if they also planned to quit. It is interesting that Jesus did not run after his disciples saying, Don’t go I was just speaking metaphorically! How did the early Church interpret these challenging words of Jesus? Interesting fact. One charge the pagan Romans lodged against the Christians was cannibalism. Why? You guessed it. They heard that this sect regularly met to eat and drink human blood. Did the early Christians say: wait a minute, its only a symbol!? Not at all. 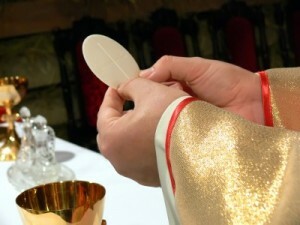 When trying to explain the Eucharist to the Roman Emperor around 155AD, St. Justin did not mince his words: “For we do not receive these things as common bread or common drink; but as Jesus Christ our Savior being incarnate by God’s word took flesh and blood for our salvation, so also we have been taught that the food consecrated by the word of prayer which comes from him . . . is the flesh and blood of that incarnate Jesus. Not many Christians questioned the real presence of Christ’s body and blood in the Eucharist till the Middle Ages. In trying to explain how bread and wine are changed into the body and blood of Christ, several theologians went astray and needed to be corrected by Church authority. Then St. Thomas Aquinas came along and offered an explanation that became classic. In all change that we observe in this life, he teaches, appearances change, but deep down, the essence of a thing stays the same. Example: if, in a fit of mid-life crisis, I traded my mini-van for a Ferrari, abandoned my wife and 5 kids to be beach bum, got tanned, bleached my hair blonde, spiked it, buffed up at the gym, and took a trip to the plastic surgeon, Id look a lot different on the surface. But for all my trouble, deep down Id still substantially be the same old baby boomer. St. Thomas said the Eucharist is the one instance of change we encounter in this world that is exactly the opposite. The appearances of bread and wine stay the same, but the very essence or substance of these realities, which cant be detected by a microscope, is totally transformed. What was once bread and wine are now Christ’s body and blood. A handy word was coined to describe this unique change. Transformation of the sub-stance, what stands-under the surface, came to be called transubstantiation. What makes this happen? The power of Gods Spirit and Word. After praying for the Spirit to come (epiklesis), the priest, who stands in the place of Christ, repeats the words of the God-man: This is my Body, This is my Blood. Sounds to me like Genesis 1: the mighty wind (read Spirit) whips over the surface of the water and Gods Word resounds. Let there be light and there was light. It is no harder to believe in transubstantiation than to believe in Creation. But why did Jesus arrange for this transformation of bread and wine? Because he intended another kind of transformation. The bread and wine are transformed into the Body and Blood of Christ which are, in turn, meant to transform us. Ever hear the phrase: you are what you eat? The Lord desires us to be transformed from a motley crew of imperfect individuals into the Body of Christ, come to full stature. Our evangelical brethren often speak of an intimate, personal relationship with Jesus. But I ask you, how much more personal and intimate can you get? We receive the Lords body into our physical bodies that we may become him whom we receive! Such an awesome gift deserves its own feast. And that’s why, back in the days of Thomas Aquinas and St. Francis of Assisi, the Pope decided to institute the Feast of Corpus Christi. Please remember to pray for the success of the International Eucharistic Congress which is now taking place in Dublin.